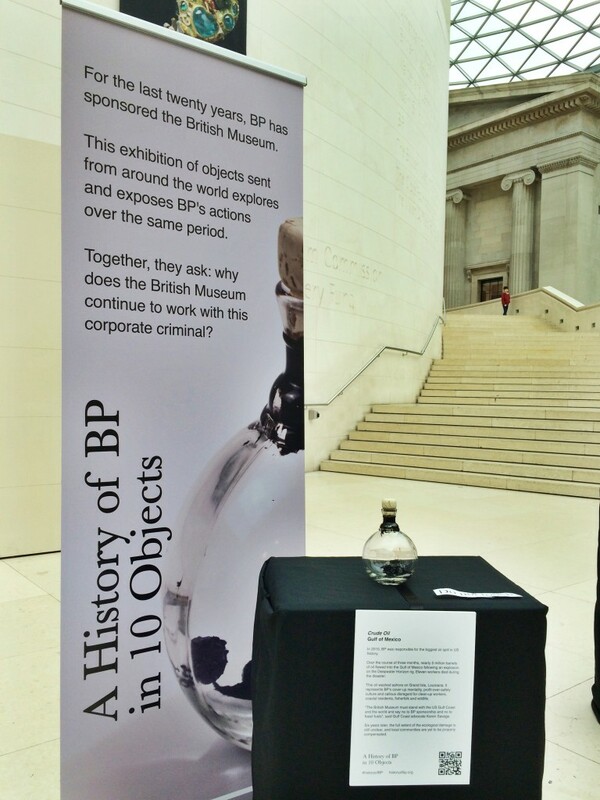 Security crackdown fails to stop our “cashmob” in the British Museum – BP or not BP? Posted on May 15, 2017 May 22, 2017 by BP or not BP? Game show host Desmond Solaris welcomes the crowd to “Who Wants to Pay a Billionaire?”. Photo by Kristian Buus. Yesterday, 40 performers from the activist theatre troupe BP or not BP? took over the British Museum’s iconic Great Court with a performance protest targeting the museum’s sponsor BP. Dressed in glittery bow ties and suits, their theatrical intervention took the form of a “rigged gameshow” highlighting the huge contrast between BP’s hefty £210 million handout from the UK government in 2015 and BP’s much smaller payments to museums and galleries. The protest concluded a global fortnight of action calling on public institutions to cut their ties to fossil fuels, with performances in the past few days at the Total-sponsored Musée du Louvre in Paris and the Shell-sponsored Van Gogh Museum in Amsterdam. BP gets ready to play the “Pay Your Cards Right” round. How much does the oil company receive from the taxpayer? Photo by Kristian Buus. Some of the highly dangerous items confiscated by museum security: quiz questions and a spangly waistcoat. BP gets all the questions wrong, but still wins £210 million of our taxes! Photo by Kristian Buus. The performance drew upon figures featured in a new infographic launched on Friday by climate campaigners Oil Change International and Art Not Oil. It highlighted how in 2015, the UK government handed over £210 million of taxpayers’ money to BP in subsidies while the oil giant touted its £2 million of arts sponsorship, money split between four museums and galleries: the Tate, the British Museum, the Royal Opera House and the National Portrait Gallery. In the same year, those four cultural institutions received over 50 times more from the taxpayer than from BP, with around £110 million of funding coming from central government . The new infographic from Oil Change International and Art Not Oil. Designed by Margherita Gagliardi. In 2016, BP announced that it would end its 26-year sponsorship of the Tate following high-profile protests by arts activists. BP claimed its decision was down to the low oil price and “challenging business environment”, a claim contradicted by these figures. Last July, a new 5-year sponsorship deal with the British Museum, Royal Opera House, National Portrait Gallery and Royal Shakespeare Company was announced and met with widespread disapproval from high-profile figures in the arts, sciences and cultural sector. In that new deal, BP will cut its payments to the arts by a quarter. Oil subsidies continue to increase massively, with former Chancellor George Osborne’s last two Budgets in 2015 and 2016 transferring billions of government funds to the industry. His successor Philip Hammond has declined to reverse the handouts and has started a review of whether they should go further. BP or not BP? has performed inside the British Museum without permission 24 times since 2012, with performances including a guerrilla exhibition entitled ‘A History of BP in 10 Objects’ parodying the museum’s own ‘History of the World in 100 objects’, and a mass “splash-mob” of 200 people including a 40-foot sea monster puppet. Today’s performance comes at the end of ten days of global action hosted by climate campaigners 350.org, calling on public institutions to cut their ties to fossil fuels by withdrawing investments and dropping sponsorships. After receiving a tiny handout from BP’s pile of taxpayer cash, the British Museum has had enough. “Deal or No Deal? No more BP deal!”. Photo by Kristian Buus. Total for the ‘Big Four’ cultural institutions: £109.6 million. Note that Tate is no longer sponsored by BP, but the Royal Shakespeare Company has been added into the oil company’s five-year sponsorship deal for 2018-2022. May 14th 2017: Join our Cashmob in the British Museum!